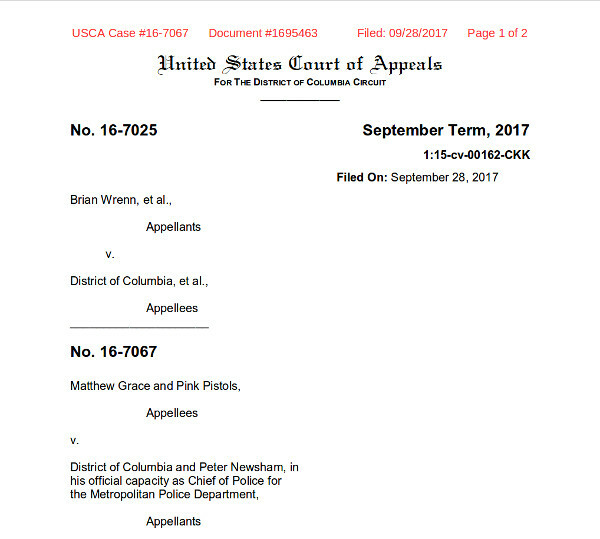 The government of the District of Columbia has decided not to appeal the Circuit court decision in Wrenn v. D.C.
A week ago the U.S. Court of Appeals for the District of Columbia Circuit ruled that they would not rehear Wrenn v. D.C. en banc. That ended the D.C. Circuit level of appeals for the District of Columbia. The issue was whether D.C. law, that was used to arbitrarily deny concealed carry permits, was constitutional. D.C. lost. The question became, would they appeal to the Supreme Court. The city’s attorney general said the decision not to appeal the ruling was a strategic one. He worries if the city were to appeal to the Supreme Court and lose, it would affect similar gun regulations elsewhere including in Maryland, New Jersey and New York. "I continue to believe the District's `good reason' requirement is a common-sense, and constitutional, gun regulation,” District of Columbia Attorney General Karl A. Racine said in a statement. “However, we must reckon with the fact that an adverse decision by the Supreme Court could have wide-ranging negative effects not just on District residents, but on the country as a whole." The attorney general acknowledged receiving several phone calls from elected and unelected officials in other jurisdictions worried about the effect of such a ruling against the city. But Racine said the decision was ultimately made in his city's best interest. At the Gun Rights Policy Conference a few days ago, two separate opinions were expressed about the possibility of the government of the District of Columbia appealing the decision to the Supreme Court. Both were put forward by intellectual heavy hitters. I paid attention. John Lott, the academic well known for his research showing that the carry of concealed guns decreases crime, told me that there would be intense pressure on the D.C. government. The pressure would be against appealing the case, because major leftist entities in the Democrat party would see it as too risky. Alan Gura, perhaps the most well known and successful attorney defending the Second Amendment had a different opinion. In a taped presentation, recorded before the D.C. ruling was made, he believed that the D.C. government would appeal the ruling to the Supreme Court. John Lott's prognostication in this case turned was the correct one. This shows a sea change in thoughts on the left about court fights on the Second Amendment. Many on the left now fear what the Supreme Court might do. The Supreme Court may actually uphold the Constitution. It has routinely failed to do so for decades. If, as is likely, President Trump is able to appoint another justice to the Supreme Court, to replace any of the four ideological leftists, or the leftist leaning justice Kennedy, the odds increase for upholding the Constitution. I still say these cases are being filed in the wrong courts. issues concerning local or state issues in conflict with the constitution belong in the original jurisdiction of the supreme court. Article three specifically gives original jurisdiction to the supreme court. questions of constitutional issues especially guaranteed rights belong to the supreme court. local governments can not amend the second amendment. Movie Review of "Let There Be Light"